Dr. Abhilash Sandhyala practises Vascular Surgery / Interventional Radiology in a state-of-the-art clinic located at Kukatpally, Hyderabad. The clinic is stocked with the latest in medical equipment. 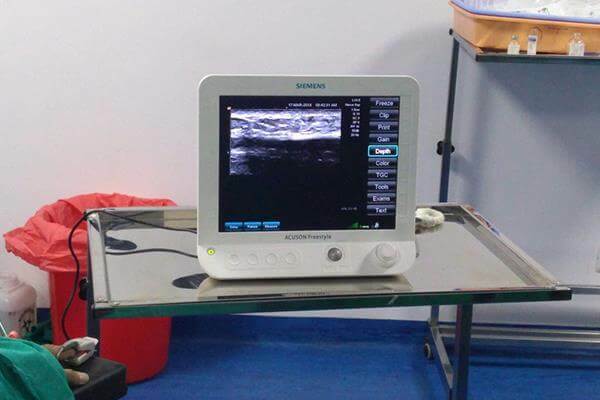 Dr. Sandhyala’s clinic boasts a ‘Siemens Acuson Wireless Ultrasound Machine’. This is the world’s first wireless ultrasound solution, redefining ultrasound access in the interventional suite and at the point of care. This machine is scalable, to promote automated workflow, clear visualization, and faster access to the ultrasound procedure using cable-free and wireless technologies. This ultrasound machine is especially suited to perform ultrasound-guided procedures in Interventional Radiology. It has unprecedented image clarity even in the most demanding of environments. In simple terms, it means it reduces the chances of infections while doing procedure with ultrasound guidance. This is a high end equipment not present in any Hospital in INDIA. Dr. Abhilash Sandhyala was the first doctor to import this machine primarily to provide the BEST results for patients. No other clinic or Hospital can claim to use such an advanced machine while treating patients. Besides this, the clinic also has a 1470 nm High-end Laser Machine. This is the only high-powered laser with proprietary pulsing technology, optimized for soft tissue ablation. Its 1470 nm wavelength is highly and easily absorbed by both water and haemoglobin, making it ideal for ablating soft tissue. As the laser energy ablates the endothelium of the vein, it simultaneously seals off the blood vessels to minimize bleeding. 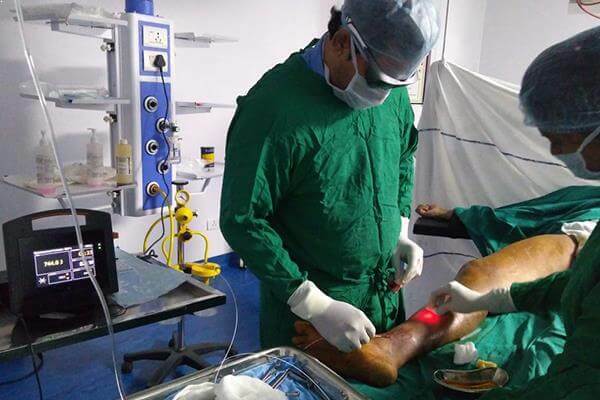 In simple terms, in a day and age where most patients think that they are getting laser treatment done by other doctors for less cost, they usually end up getting RFA ( radio-frequency ablation ) treatment which is an old technology or Laser with a Low end Chinese manufactured machine which comes on rental basis (to save hospital costs). The disadvantage with other hospitals because of this is that the results are poor and the chance of recurrence after treatment is high. So , Dr. Abhilash Sandhyala has purchased the highest quaility Laser Machine inspite of the high cost of the machine, primarily to provide that 98.1% chance of success with Laser Treatment which no other hospital or doctor can claim to have. So, Dr. Abhilash Sandhyala has the best combination of a Wireless Ultrasound Machine and a high end imported 1470nm Laser machine, because of which he has the highest success ratio among all doctors, Pan India.